Recruiting and staffing agencies that succeed with SEO and rank highly in Google search results do two things very well. First, they create engaging and informative content that provides value to their clients and candidates. Second, they effectively use recruitment SEO so that clients and candidates have the opportunity to discover their content on Google and read it. The world of content marketing is an incredibly crowded space. There are hundreds, if not thousands, of articles on the same topic and therefore, it’s difficult to stand out. While Google does its best to show only the best results for a specific query, it’s often difficult for their algorithms to surface only the truly top-notch articles. There are many components to effective SEO for recruitment agencies and staffing agencies but we’re going to focus on only one today – you need to make sure that your on-page SEO is perfect. A short definition – On-page SEO for recruiters deals with the structure of your site and content on your pages whereas off-page SEO for recruiters refers primarily to links that point to your page. On-page SEO is critical for many reasons but most importantly, because it helps you rank higher in Google search results, which, in turn, drives traffic to your site. Exclusive Bonus: Watch the step-by-step video walkthrough of the Yoast SEO plugin for WordPress to learn how to get the technical details right for each blog post. Here are the five steps that every recruiting agency must take to perfect their on-page SEO and rank their content higher in Google. The title tag is what shows up as the link in Google search results so it’s a huge factor in determining if your article gets clicked. 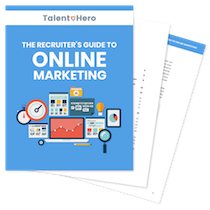 So what you should do to make sure you stand out from other recruiters? Keep it the right length. Google typically displays the first 50-60 characters of a title tag. If you keep your title tag under 60 characters, research suggests that you can expect about 90% of your titles to display properly. You can use this title tag preview tool to see how your title will appear in Google’s search results. Make sure it has at least two of the three ingredients of a click-worthy title. “A Pack of Mentos” is not something you usually see in a post about getting your dream job. The reader is now likely to be, at the very least, curious enough to want to read the story. This type of title provokes a thought and makes the reader wonder why what he or she thought to be true is not. There is an obvious conflict at play here and as a curious person, the reader will want to understand both sides and see what the author thinks is the best choice. One quick note – be careful with overusing numbers in your title tags. They tend to work great on an individual post but when every post on your blog is “5 ways to do this” and “7 things to think about that”, they can start to lose some of their appeal. Make your candidates or clients feel something and you’ve dramatically increased the odds that they’ll click on your content. Which title sounds better “7 ways to land your next C-suite executive” or “7 surprising ways to land your next C-suite executive”? With the single addition of the emotionally-loaded word “surprising”, I’ve made the title significantly more interesting. There are tons of words like this that you can use including astonishing, uncommon, irresistible, tempting, insane, remarkable, epic and killer. Get out your thesaurus if you want need some more. 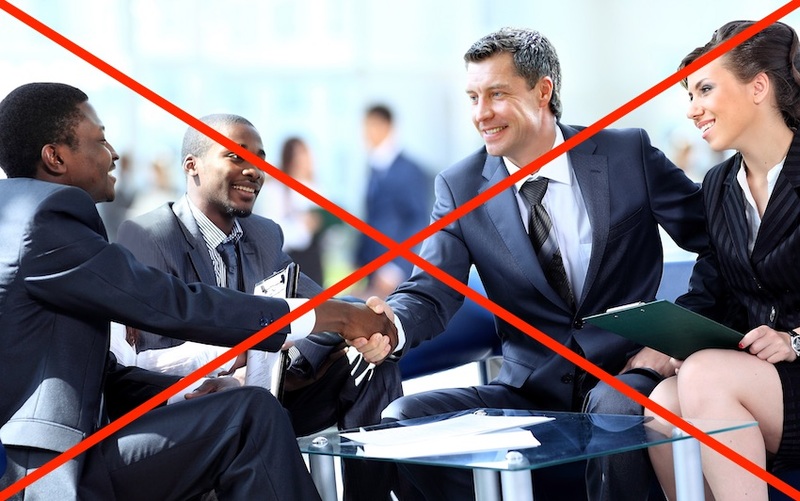 A quick note on executive search SEO: I’ve had multiple people who run executive search firms tell me that this would never work for their business because nobody looks for an executive recruiter using search. When I ask how they know that, they tell me that they’ve asked their clients and nobody had ever used SEO to find an executive recruiter. When I tell them that they have an issue with the sample of people they’re asking (in other words, anybody searching for an executive recruiter would never have found them), there is always a lightbulb moment and it sets in that SEO might just be able to help their executive search firm. I am always surprised at how often even clients that understand SEO for recruitment agencies overlook this crucial point. The meta description is (sometimes) what shows up on Google’s search results page underneath the title tag. I use the word sometimes because Google reserves the option to pull text from your page and show that instead if they think it is more relevant to the user’s search. A meta description also helps Google understand what your page is about. To create the best meta description, you need to follow rules that are similar to the title rules. Google typically cuts any meta description longer than 160 characters. You should therefore keep meta descriptions between 150 and 160 characters. Write one or two sentences that tell the reader what the blog post is about and make sure to drive curiosity, offer a benefit and elicit emotions. A client had a blog post that generated a ton of traffic even though the percentage of people who saw it in Google’s search results and clicked it was relatively low. The post, on preparing for an interview as a bank teller, originally had a meta description that read as follows: “This blog post will tell you what you need to know to prepare for your interview as a bank teller.” On top of referencing the fact that it is a blog post (the user probably already knows this), it is straight up boring. We changed it to “Find out how you can use these 5 easy tips to ace your bank teller interview” and saw the click-through rate almost double! If you go to the average recruiter’s blog post, what do you see? Typically, you’ll find a cheesy stock image of something like two people shaking hands at the top of the page followed by a wall of text. The image adds nothing to the post and the wall of text can be intimidating to the reader. Here are a few tips on how to use images to your advantage. Go to a site like Fiverr and create a custom blog image for each post. You can usually get this done for $5-$10 and you immediately add a level of professional appeal to the post. People start taking you more seriously before they’ve even read your content. Add diagrams where appropriate. Some ideas are just hard to explain in words. Mock up a diagram with a pen and paper and get a freelance graphic designer (once again, Fiverr is a good option) to turn it into something professional. Make sure that image file names include important keywords for your article. For example, if your article is focused on interview tips for finance, your image name should be something like interview_tips_finance.jpg. Also, your alt text should include similar keywords. On top of displaying professionalism and adding value to the user, images can have huge SEO value for recruiters. One of Google’s key ranking factors is called “time on site”. Essentially, when you click a link from a Google search, Google measures how long you spend on the site. Why? Because Google assumes that if the site is a good match for your search, you will spend more time on the site. And if it’s not, you’ll quickly leave. Images tend to increase time on site as people explore both the text and images and this can have a massively positive impact on your rankings. Nobody is expecting that you become an HTML guru so that you can master SEO for recruitment agencies. However, learning the very basics can be tremendously helpful when trying to optimize a post, especially heading tags. A heading tag is a bit of code that you “wrap” your headings in order to give them proper prominence on the page. There are six heading tags, numbered 1 to 6 (clever!) but typically, you will use the first three, at most. To help Google understand the title of your post (which can be different from the title tag mentioned in point 1), make sure that it is wrapped in an <h1> tag. This means that if you look at your HTML source code, you should see something like “<h1> This is the long and engaging title for my post </h1>.” Use only one <h1> tag per page or you may confuse Google. Most content management software like WordPress tends to automatically wrap your title in an <h1> tag but you should check to be certain. When you have secondary headings that you are using to break your post into digestible chunks, use an <h2> tag for each heading. Also, make sure you put any important keywords in at least one of your <h2> tags to signal to Google that it is a keyword for which you want to rank. The best practice would be to use important keywords in the first <h2> tag on the page. For example, for a case study about how a recruiter outperformed an internal HR team, you may want your first <h2> tag to say something like “Recruiters vs. HR – Diving deeper into the debate”. This is the most complex SEO that a recruiter is going to need so obviously, we’re going to have to start with a definition. Latent Semantic Indexing or LSI keywords are keywords that are semantically related to the keywords for which you want to rank. This is not the same thing as synonyms for your keywords. These are words that are in some way related to your keywords and will help Google understand the meaning of your page. For example, if you’re writing about the difficulty of finding high-quality developers, you would want to make sure that your article contains development-related keywords like waterfall, agile, scrum and C++. If you’re still struggling to understand this concept, have no fear because the LSI Graph website is here to help. All you need to do is enter your keyword into the site and you will get a list of LSI keywords that you should consider sprinkling throughout your article. Don’t feel like doing all of the work yourself? Contact Talent Hero and we’ll perform an SEO analysis of your site and take care all of the work for you. What if I’m not convinced? In speaking with recruiters, one of the common things I hear is that Google just isn’t the right place to market their business. And of course, that is true. The vast majority of recruiting firms will never rank on the first page for multiple important keywords and as a result, Google will do nothing to help your business. But imagine a different world. A world where actually you spent time working on the SEO for your site. A world where you rank on the first page of Google’s search results for all of the keywords related to your business. How much better off would your business be? It’s time to stop imagining as I am going to show you what this world looks like and conclusively prove to you that continuing to ignore Google is a HUGE mistake. Let’s imagine you are an executive search firm specializing in the retail sector. How many visitors per month could you expect if you were on the front page of Google for all of the relevant search queries? The beauty of this question is that we can easily break it down and come up with a very precise number. We start by creating an account with Google AdWords (it’s free!) 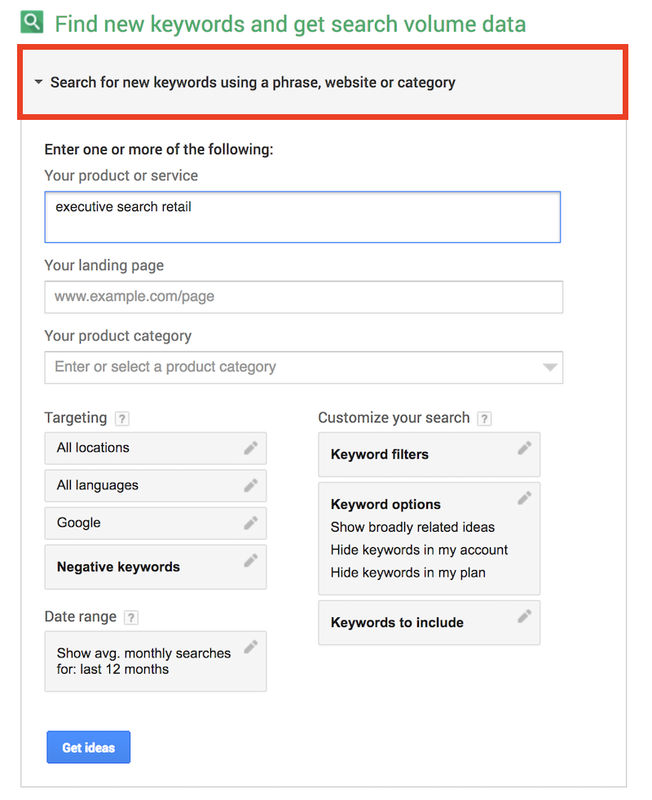 and then entering “executive search retail” into the first section of Keyword Planner (“Search for new keywords using a phrase, website or category”). When do we that, Google will give us back a huge list of keywords (not shown). In essence, we now have a blueprint of how a client looks for a recruiting firm in the retail sector. 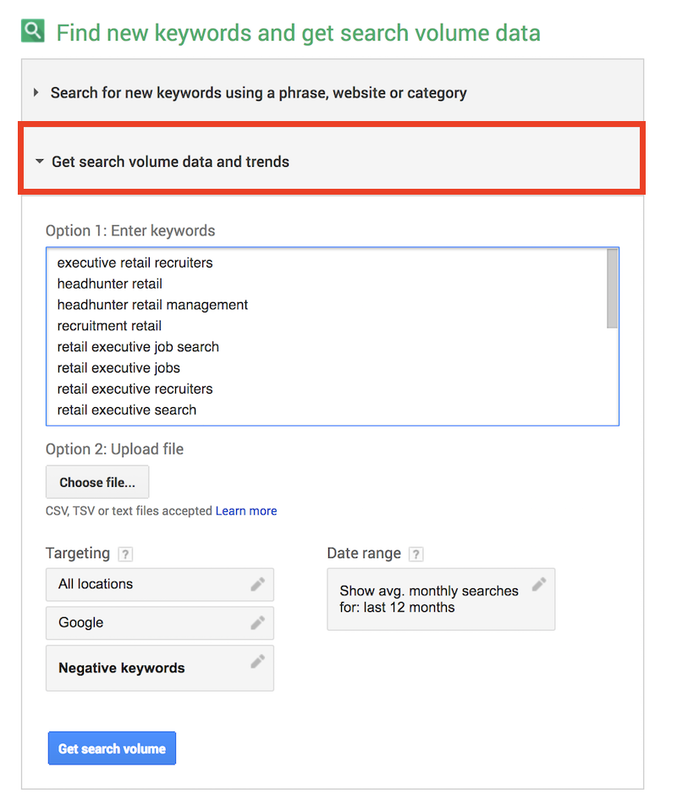 We now put these keywords back into the second section of Keyword Planner (“Get search volume using data and trends”). And bam! Google gives us a pretty-looking bar chart and table. We can review the search volume in a given month we would expect from targeting all of those keywords. And we can break it down further by individual keyword. So what do we see? 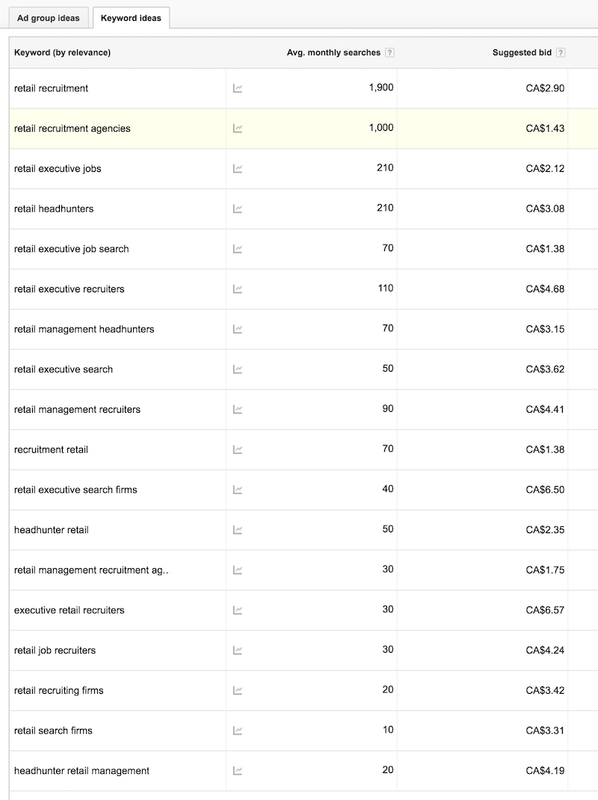 There are about 4,250 search per month for these queries alone! Now let’s do some basic math. Let’s assume that you figure out how to rank in the third position, on average, for these search queries. According to Moz, a leading search engine tracking company, you can expect people to click on your search result about 10% of the time when you are in the third spot on a Google search results page. 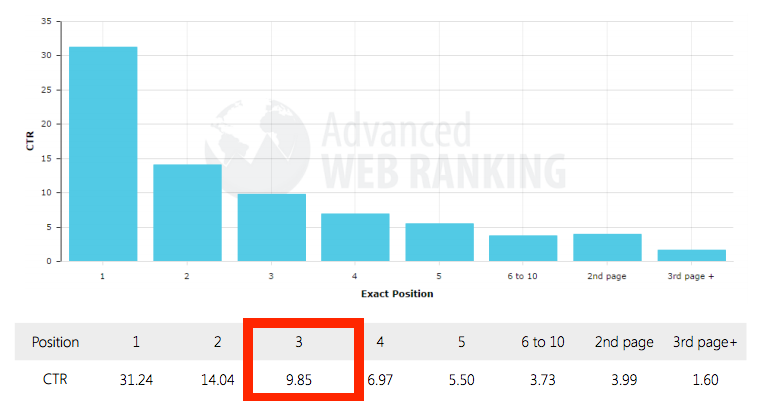 In other words, by ranking for just these keywords, you will receive 425 new visitors to your site per month (4,250 search impressions * 10% clickthrough rate). If you can turn just 0.5% of those visitors into new clients (1 in 200! ), you would get about about 2 new clients per month or 24 new clients per year from dominating these search results. The math doesn’t lie. It is obvious that dominating Google search can bring huge benefits to your business. It’s one thing to see what it would be like if you dominated the search results. It’s quite another to actually do it. Getting there is not always so easy. So if you want to learn more, stay tuned in the coming weeks as I expand on what you need to do take your website from search zero to search hero. And if you don’t want to wait, book a call with us now and we’ll walk you through the process over the phone. Bonus Content: We wrote this article back in 2017 with a hypothetical SEO case study but we now have one with real client data! Download the case study now.